The Door of Hope, a protestant mission, was created in Shanghai or Canton, China in 1901 to help destitute children. 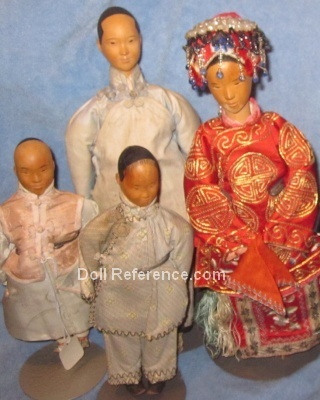 The dolls head, hands and arms to the elbow are made of carved Chinese pearwood and are smooth as satin and unpainted or varnished, the hair, eyes and lips are painted and the body is made of cloth stuffed with raw cotton. The girls of the mission hand made each dolls clothing, an exact replica of clothing worn by the Chinese people. Door of Hope dolls are unmarked, though some dolls had tags that read; N.E. Branch Women's Foreign Missionary Society. It's believed no more than 50,000 dolls were produced.